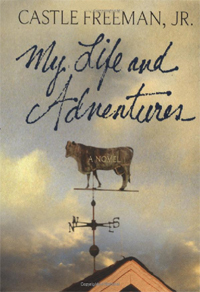 My Life and Adventures: a novel | Castle Freeman, Jr. Fleeing the wreckage of a murky diplomatic job in a chaotic Latin country, Mark Noon finds himself down and out and holed up in a squalid motel somewhere in Mexico. Desperate, he claims an odd bequest from a long-deceased family friend and comes north to move into a dilapidated farmhouse in the hills of rural Vermont. There, Noon begins to rebuild, both the house and the fragments of his life. He comes to know the complex histories of various residents of Bible Hilll, including Orlando Applegate, the lawyer and town father who becomes Noon’s mentor, and Orlando’s troubled daughter, Amanda, who captures Noon’s heart and begins to share her life with him. With her help and that of a cast of others, living and dead, local and from-away, respectable and otherwise, Noon learns to embrace his new community and to thrive there. My Life and Adventures sets the haunted and transcendentalist New England of Hawthorne, Thoreau, and Emerson side by side with the dope farmers and llama herders, survivalists and leaf-peepers of our day. The result is a delightful, unusual novel of one man’s estrangement and homecoming. We had roads that went no place, villages that had disappeared, strange animals and birds, a vanished aristocracy of the mad, trains that weren’t there, witty lawyers. It was that kind of place altogether, Bible Hill. Still is.